This villa can be found in a block of adjoining terrace properties each consisting of two floors with three separate bedrooms. The formations of the villas are in an L-shape around the main swimming pool and garden area. In the two main blocks, in your villa you will find on the first floor the two larger double bedrooms with, a double bed, wardrobe two bedside tables, and a medium size mirror on the wall over a separate dressing table and stool. Both the main bedrooms have ceiling fans and air-conditioning for your comfort. The main double room has a room safe securely installed for your use. Both the main bedrooms have a patio door which opens onto small balconies over looking the pool/garden area. There is one smaller single room, on this floor, facing the car park, which is to the back of the properties; this is fully furnished with a single bed, wardrobe, one bed-side table, and a medium size mirror on the wall over a separate dressing table and stool. This smaller single room has a ceiling fan, but no air-conditioning. On this first floor you will also find the bathroom, which has an enclosed shower unit, toilet with basin and bidet. On the lower level there is a large lounge/dining area and separate kitchen, with an array of kitchen utensils, microwave and family sized fridge freezer. On this level, in the lounge area, there is also a floor fan, and a traditional hand-made sofa-couch and an armchair, plus a coffee table. You are provided with a TV, playing local Broadcasting TV Channels, for your use throughout your stay with us. Opposite the Kitchen there is a separate downstairs toilet, and the front door to the villa leading to access to the car park. These villas have a large patio-verandah leading to the main swimming pool area. All patio-verandah areas have a roof over them in order to keep the veranda cool, and shaded. 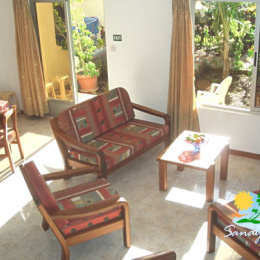 Each villa is fully furnished with garden furniture for your use, during your stay. SECURITY: Due to increasing security on the complex, we have now introduced grill bars for all villa doors and windows. For your safety, we have also updated our CCTV cameras on location. - A refreshment welcome pack on arrival. - Fresh towels and linen. - Twice weekly maid service. - Iron and Ironing board are available on request. - Airport transfers available on request. - Car rental services available on request. We have seven duplex villas for larger groups of up to five and one studio suitable for couples. Each boutique style villa is equipped for self catering and there is air conditioning provided on site for your comfort. We can also provide you with a safe for your peace of mind, although we charge a small (refundable) deposit for the key. The villas are located in a very quiet rural area of Mauritius . All the villas share access to a communal swimming pool, a south facing garden, a south facing patio area, a south facing balcony, sea views, panoramic views. Sun loungers are available for use on request, for use around the swimming pool area. of the villas. Conveniently situated in the tourist region of Flic en Flac there are local car hire companies nearby to cater for all your travel needs. The beach is less than a 2 minute short walk from Sandycove Villas and the local bus stop provides comprehensive links to the rest of the island. Here at Sandycove we will always be happy to answer all your travel queries to make your holiday more relaxing.